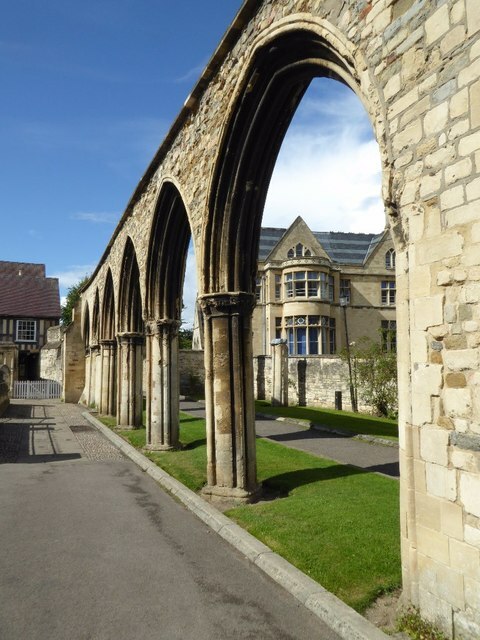 These arches are the remains of the former Infirmary of the Benedictine Abbey of St Peter and date from the early 13th century. The building on the right is the Abbot's Lodgings and today is part of the King's School. The arches are Grade I listed. Remains of the former Infirmary of the Benedictine Abbey of St Peter. Early C13. In C17 the east end of the infirmary, formerly St Bridget's Chapel, demolished, and the west end incorporated in a cluster of tenements called Babylon; in 1860 the tenements removed and the surviving C13 masonry exposed and consolidated. Ashlar and rubble. The remains of the aisled infirmary hall comprise the lower part of the wall at the west end, six western bays of the south arcade, and two western piers of the former north arcade. EXTERIOR: in the west wall the entrance doorway with moulded arch with hoodmould; the piers to both arcades have attached shafts with fillets, the capitals either moulded or carved with stiff-leaf; the arches of the south arcade elaborately moulded and framed by hoodmoulds with carved stops; above the south arcade the wall is topped by a C19 weathered capping with overhangs supported on corbels. Scheduled Ancient Monument. (BOE: Verey D: Gloucestershire: The Vale and the Forest of Dean: London: 1976-: 222).